One of the great things about working for the Department of Natural Resources is the shared passion we have for our natural and cultural resources. That shared passion is part of the basis for the trust that General Powell correctly identified as critical to leadership. Building trust is a major theme of the DNR Leadership Academy, which held its second class session on Sapelo Island earlier this month. Trust, and its bedfellow, credibility, are the glue that binds DNR employees together. Those bonds become more and more important as the world, including the world of historic preservation, becomes increasingly complex and fast-moving. Nowhere is that complexity and increased pace more apparent than in DNR’s response to natural and man-made disasters. A Critical Incident Management class works through a table top exercise. DNR Law Enforcement Division (LED) has historically been at the forefront of critical incident management (CIM), along with our Wildlife Resources Division and Parks, Recreation, and Historic Sites Division. Over the last several months, two independent, but linked, trends have emerged that point to greater involvement in CIM and, more importantly, recovery operations for historic resources by the Historic Preservation Division. In May, the Commissioner’s Office and LED led a "Train the Trainers" workshop in CIM at Unicoi State Park and Lodge. I participated in that workshop as a student. It was exhilarating — and exhausting! We worked for three days slowly building our knowledge of CIM in a combination of class sessions and increasingly-complex table top exercises. Over the next several months, instructor teams will fan out across the state teaching classes to DNR staff. This will help DNR develop a much more robust response capability when the next disaster occurs. Separate from the CIM training, HPD is working on a historic preservation critical incident recovery manual. This will provide the protocols for who on our staff is mobilized to respond following a critical incident, what equipment they need for the field, how they carry out their damage assessments and provide recommendations, and other information compatible with the Incident Command System (ICS) and the National Incident Management System (NIMS). It will also be linked to the DNR All Hazards Manual, which the agency is currently revising. One of the issues HPD is discussing with LED is intelligence gathering during the initial response. How does DNR gather information regarding impacts to the historic resources that we manage? Where does that information go? Who is responsible for synthesizing that information and transmitting it to HPD? I’m excited about working with our sister divisions on this very important issue, which is becoming a central concern of historic preservation at the global level. Look for more on this as we move through the year, and if you have relevant information about how other states are addressing this issue, let me know! Have a safe and fun Independence Day! During the past three decades, spatial technologies have become an increasingly important component in archaeological analysis. Today, one would have a difficult time finding an archaeological project that does not implement methodologies like geographic information systems (GIS), global positioning systems (GPS), remote sensing techniques, and 3D imaging applications in some way, shape, or form, contributing to how archaeologists collect, store, analyze, and represent data. One of the most prominent technologies today is terrestrial laser scanning (TLS). Terrestrial 3D laser scanners record all that is in their field of view, producing large point clouds of data. The laser simply records a point as soon as it hits a solid surface and then reflects it back to the instrument sensor. Most scanners have built-in digital cameras that allow them to capture color data while scanning. These laser scanners have been used for many diverse applications like ecological conservation and biodiversity studies, and with archaeological objectives ranging from monitoring environmental erosion around sites to the promotion of virtual tourism. Since the scanners do not only record the surface, but can be used to create 3D models of archaeological objects and features, laser scanners are a great benefit for the recording, documentation, and preservation of heritage and archaeological sites, as they are increasingly endangered by natural and man-made threats. Worldwide, there are several university- and heritage preservation-initiated programs that make it their mission to conduct 3D scanning projects at prominent sites. For example, earlier this year, professor Chad Keller and his students from the Savannah College of Arts and Design (SCAD), Preservation Design Department, set out to document the historic tabby ruins on Sapelo Island’s Chocolate Plantation. The full 3D model can be viewed here. While the incredible detailed imagery produced through the implementation of laser scanners certainly allows for more detailed archaeological research, 3D scanning techniques have already left an important footprint in the fields of preservation and conservation as well. As previously mentioned, cultural heritages are increasingly threatened by environmental changes, wars, natural disasters, and human negligence. The scanning of these heritages, like the Chocolate Plantation slave tabby ruins, can greatly aid our preservation efforts. As discussed in recent Preservation Posts articles - April 2016 and June 2016 - Section 106 requires federal agencies, or their delegates, to take into account the effects their undertakings have on historic properties that are eligible for or listed in the National Register of Historic Places. It is a four-step process that involves identification, evaluation, assessment of effects, and resolution of adverse effects, if any. What many people may not know is the breadth of parties that can, and should, be involved in the Section 106 process. Certain parties are entitled to participate, while others may be involved, but are not a required consulting party. As such, we’ll focus our Environmental Review Program upcoming articles on one or more of these parties, to explain each’s role in the Section 106 process. A federal agency action (licensing, permitting, funding, etc.) 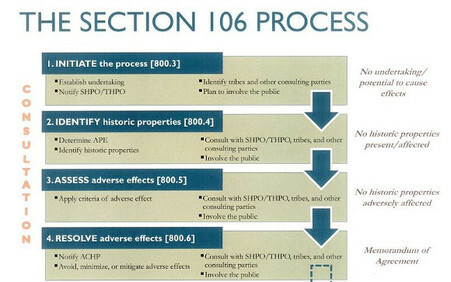 is what triggers the Section 106 process. If the federal agency is not involved, Section 106 is not required. The agency is responsible for conducting the Section 106 review for the project prior to approving the expenditure of funds or issuing a license or permit. The primary responsibility of the agency is to ensure they meet their Section 106 responsibilities. They are responsible for managing the project schedule, handling the steps in the process, and involving or coordinating with all consulting parties. Sometimes there is more than one federal agency involved in a project, such as a Federal Highways road project that crosses rivers, needing Corps of Engineers permitting. In cases such as this, one of the agencies is designated as the lead federal agency for purposes of Section 106 and becomes that responsible party. The agency is also responsible for coordinating the Section 106 process with other laws they are required to comply with, such as NEPA. Most federal agencies have internal guidance on how their agency will comply with Section 106, which means that every federal agency goes through those steps in the process a little differently. Some handle the process all themselves and go through it one step at a time, while others gather information for all four steps at once and send it all through the process together. Some delegate portions of the steps to applicants, while others delegate all of the process to a local entity or applicant. A required participant is the State Historic Preservation Officer (SHPO) – which in Georgia is our Commissioner of the Department of Natural Resources, Mark Williams. Of course, Williams has many other responsibilities, so our Deputy SHPOs are Historic Preservation Division (HPD) Director, Dr. David Crass, Archaeology Section Chief and State Archaeologist, Bryan Tucker, and Historic Resources Section Chief, Bill Hover. HPD is the State Historic Preservation Office (SHPO) in Georgia, and carries out preservation-related duties around the state, which includes much more than Section 106 reviews. Our office is the primary partner in the Section 106 process and is here to advise and assist the federal agency, their delegates, and applicants in carrying out their responsibilities. Our involvement is meant to make sure that the interests of the state and its citizens are taken into account when planning federal projects. Federal agencies, or their delegate/applicant, are required to send sufficient documentation to our office in order to review the undertaking and be able to concur, or not, with the determinations that the agency has made regarding identification, evaluation, and assessment of effects. If resolution of adverse effects is needed, our office is a required signatory to the agreement document and a reviewing party of mitigation and similar components. In states where there are tribal lands, there can be a different primary partner of the federal agency, or in states where there are not tribal lands but tribal interests, such as Georgia, there can be a third participant, and that is the Tribal Historic Preservation Officer (THPO). On tribal lands, the THPO is the partner responsible for advising and assisting the federal agency in carrying out the agency’s responsibilities. The THPO is responsible for all or part of the functions of the SHPO with respect to tribal lands. Stay tuned for a follow-up article regarding Indian tribe involvement when the project is not on tribal lands. The Georgia Archives will host a monthly Lunch and Learn Lecture Friday, July 14. The Lunch and Learn program will be on Native American ancestry research. Yvonne Mashburn Schmidt, Certified Genealogist, will present "About That Native American Grandmother: Clues That Help & Hinder Our Family Stories." Stories of Cherokee ancestry are common among families whose ancestors were established in the southeast prior to the Trail of Tears. An estimated 44 percent of native southerners believe they have Indian ancestry. Many feel strongly compelled to accept the challenge to either document or disprove these stories, but are uncertain about how to proceed. The program requires no registration and is free and open to the public. Lunch and Learn programs begin at noon and last about an hour. The next Historic Preservation Commission Training, hosted by the Historic Preservation Division, will be held in conjunction with the Georgia Downtown Conference in Columbus, Ga. on August 22. Additional Details, and a registration form, are located on the HPD website. Preservation Posts is published to inform the public about historic preservation issues and developments from the perspective of the SHPO. In keeping with that purpose, HPD has inaugurated a policy of occasionally soliciting guest articles that are directly related to our statutorily mandated programs. Please note that we do not publish opinion pieces. We also retain editorial control as well as the right to reject any submission. To pitch or submit a piece, or ask questions concerning an idea, email HPD Public Affairs Coordinator Jeff Harrison at jeff.harrison@dnr.ga.gov. TITLE IMAGE: Durham Place, in Maxeys (Oglethorpe County), was listed in the National Register of Historic Places in June. Copyright © 2017 DNR Historic Preservation Division, All rights reserved. Change your subscriptions, password or email address, or unsubscribe at any time, on the Subscriber Preferences Page. Use your email address to log in. Questions or problems? Please contact subscriberhelp.govdelivery.com. This service is provided by the Georgia Department of Natural Resources using GovDelivery.